Apricot Chamomile Soy Candle has the subtle aroma of Apricots from the orchard and the calming scent of Chamomile. Bright, crisp, fruity and herbaceous. This is a wonderful combination. Black Bamboo Soy Candle has a fresh scent with a hint of spice. Your nose will first pick up fresh Bamboo, the Mandarin Leaf, Agave Nectar and African Lotis then you’ll notice they’re perfectly paired with spices like Cardamom, Nutmeg and Black Peppercorn. The dry base notes of Safari Sandalwood, Patchouli and Tonka Bean hold it all together. Blood Orange Soy Candle is delectable! It is uplifting and stimulating with its blended scents of spicy Blood Oranges, ripe Strawberries and Raspberries, offset by juicy Mandarin and sweet Orange. Its an orange lovers dream! Blueberry Citrus Soy Candle is sweet, fruity and citrusy. Fill your room with - HAPPY! You will love this fruity explosion. Christmas Tree Double Wick Soy Candle has the scent of Pine trees and fresh Lime with hints of Cardamom and Pepper. Perfect for those who want that real Christmas Tree smell all over the house! Cranberry Orange Double Wick Soy Candle is a wonderful scent blend of citrus notes; Orange, Satsuma, Yuzu, and Tangerine; followed by notes of Cranberry, Peach, and hints of spice. Wonderful for those who love the spicy, fruity smell of the holidays! Hazelnut & Coffee Soy Candle has the scent of Hazelnut and a touch of Cinnamon, with the smell of fresh brewed Coffee mixed in. The scent gives you that warm fuzzy feeling all over. Holiday Pomegranate Double Wick Soy Candle has a wonderful blend of Pomegranate, Citrus, Dewberry, Blackberry, Iris, Jasmine, Sheer Musk, Sandalwood, and Red Cassis. Spreads a fruity and floral holiday scent thru the whole house! Lemon Lavender Soy Candle is bright, clean, zesty and has a citrusy lemon scent with just a hint of relaxing Lavender and Lemongrass. This is a Soap Orchard everyday pick! You will love it! It's not your normal Lemon scent. Give it a try! Merlot Wine Cask Soy Candle has a subtle fruit Wine scent and a sweet Orange finish. It also has a special scent surprise: a hint of tobacco leaf. This is a surprisingly uplifting scent! Men will love this one too. 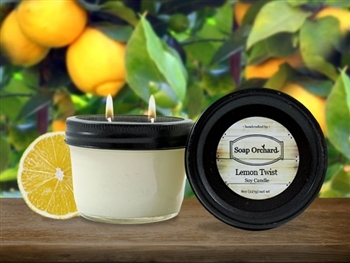 Soap Orchards Natural Insect Repellent Candle is a pleasant-smelling essential oil soy candle that repels annoying bugs, mosquitoes, no-see-ums and fleas! It has a unique aroma consisting of refreshing peppermint, and citrus. The essential oils in this natural candle all have insect repellent properties. Take your Summer evenings back! *Free standard USPS shipping will be given on this item only at checkout. All other purchased items will have regular shipping rates applied. Nuts from the Orchard Soy Candle is wonderfully nutty with the scent of Pistachio and an undertone of Almond Honey, Heliotrope, and rich, creamy Vanilla custard. It is unique, sweet and wonderful. If you are a pistachio lover, you will really love this scent. GO NUTS and try this candle in your home. Pear & Ginger Soy Candle has the wonderful fall scent of Pears mixed with the spicy uplifting smell of Ginger. Watch out, this may become an unexpected favorite! Strawberry Champagne is a wonderful scent blend of berries with the very light floral addition of Lily of the Valley. This combination will fill your space with a sweet and bright aroma. Tangerine and Lavender Soy Candle scent is soothing and uplifting. The aroma therapy on this is unbeatable! Men love this scent as well! Walnut Pear Chardonnay Soy Candle smells gloriously of the beginning of fall! The mix of sweet Black Walnuts, Pears and the oaky crisp finish of the Chardonnay wine scent. Unbeatable!